The MerryMac catboat tends to make the blood hum with a sense of adventure and challenge. Its owners claim that it has always been so since the first of about 200 MerryMacs sprouted wings on the banks of New Hampshire’s Great Bay back in the early 1950s. And MerryMac lovers will tell you that the sense of adventure and challenge are rooted in both the boat itself and her designer/builder Ned “Mac” McIntosh. I first met the boat and the man 16 years ago while sailing a little cutter in the lee of Great Guana Cay, Abaco, Bahamas. I was half-lost in a sailor’s daydream, running before a warm, 12-knot southerly when a blue, hard-chined catboat came surfing up behind me and surged past on a plane. “You wanna race, Cap?” called her skipper, a senior citizen in a long-billed cap, denim shirt and double-patched, paint-stained khakis. For the next hour McIntosh led me on a spritely chase that had us charging among the moored and anchored cruising boats in the settlement harbor. Back then he was a mere 82 years old. Now he’s 98, and he and his MerryMac are still actively sailing in the waters off his winter base, a simple cottage called Termite Terrace that he shares with his wife Terry on Guana Cay. The simple rig is well suited to first-time sailors. The origins of this swift little cat-rigged sharpie started in New Hampshire in the barn/boatshop of the farmhouse that McIntosh has called home since his birth there. During World War II he was in Panama building and repairing wooden boats for the U.S. government and later did a stint as captain on a fishing boat working between the Galapagos and Puerto Rico. Once back in New England, he began building cruising yachts with his older brother Bud on the banks of the Piscataqua River. During his years in Panama, McIntosh had made friends with boatbuilder and designer Clark Mills, the creator of the Optimist pram. In Panama the two men built their own small sloops to race after work. It was the simplicity of those boats and the fun of the evening competition that came to mind when McIntosh conceived a boat for dinghy adventuring and racing in Great Bay. 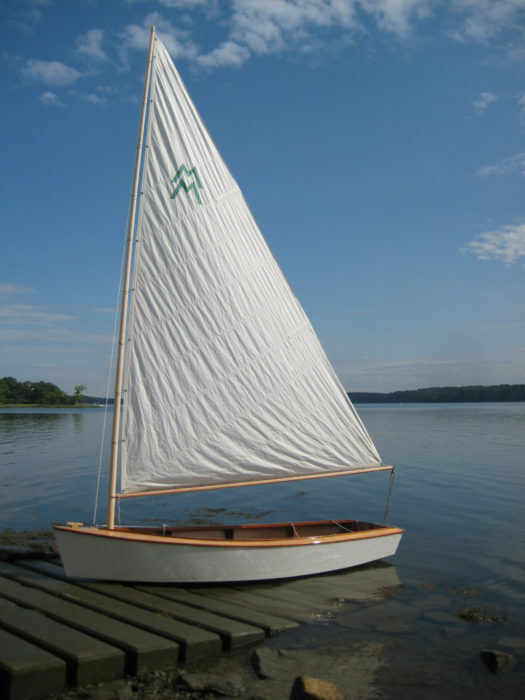 With its 90-sq-ft sail the MerryMac can make way in a whisper of a breeze. The two-boat fleet gained momentum when a friend’s cocktail party generated orders for six more MerryMacs. Soon there were more and more orders, and “McIntosh Custom Boats” was born. By 1955 MerryMac sailors had formed the Great Bay Yacht Club, and held races every Sunday. Meetings at each other’s homes provided the sailing instruction and social atmosphere for the growing membership. The club became a place where sailors could not only race but also pack a picnic lunch, load the family in their MerryMacs, and explore the wooded coves and islands of Great Bay. Mahogany stringers set under the plywood frames stiffen the bottom panels. With the MerryMac McIntosh gave the New Hampshire sailing community a basic sailboat at a price of $449. For safety he designed his boat with a broad beam, high topsides and decks. For ease of building his mind turned to a hard-chined, shallow-V, sharpie hull with no skeg. To keep the boat simple to sail, light, and inexpensive, he decided on a single triangular sail and plywood construction. The MerryMac, simple enough for beginners but with enough performance thrills for dinghy racers, caught on with local sailors and by the mid-1960s McIntosh had built 200 copies. He also made the mold for a fiberglass version that was locally produced in small numbers. Planked and decked with thin plywood, the wooden MerryMacs were intended to have a limited life span. But after 50 years many of the boats built in the 1950s and 60s are still sailing and racing in New Hampshire’s Great Bay and far beyond. Maine is home to many and the West Coast has its share. One boat has been preserved in the Woodman Institute Museum in Dover, New Hampshire. The Merry Mac is 13′6″ long and has a 5′ beam and a 6″ draft. McIntosh designed the boat to be built with ¼″ plywood for the sides, deck, floorboards, and bottom. 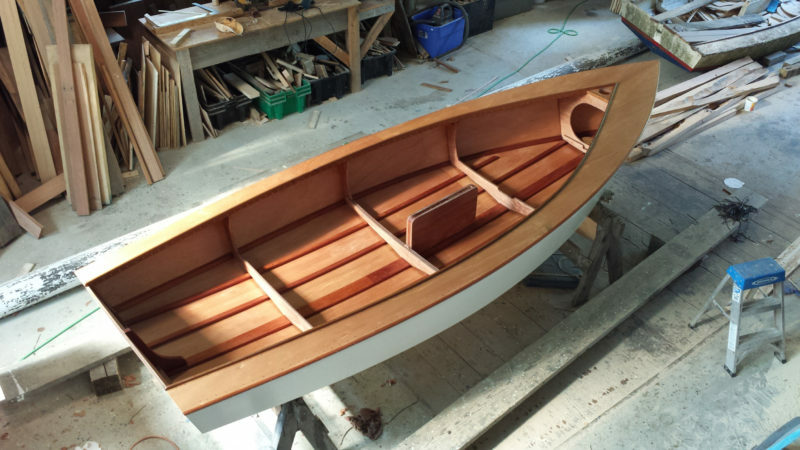 He used 5/8″ marine fir plywood for sawn frames and transom. The keel and chines are mahogany. The stem is oak. Like most dinghies, the Merry Mac is assembled upside down on a building form then rolled upright for finishing. The first 50 masts were wood; subsequent masts have been aluminum. Piper built his own MerryMac in the spring of 2014, and his enthusiasm for the design prompted his boatshop to acquire the exclusive rights to build new MerryMacs in both wood and fiberglass. Two of the things he loves about the boat are the rudder that can kick up for easy beaching and a roller-reefing boom that makes fast reefing easy from anywhere in the cockpit. Another thing that excites Piper about this boat is its carrying capacity. Four adults can stretch out on the floorboards with ease. “What’s the point of building a boat that you can’t sleep in?” asks McIntosh with a twinkle in his eyes. He’s quick to point out that when his daughter was a child, she and her parents camp-cruised their Merry Mac down the west coast of Florida for weeks. Having watched McIntosh and his wife Terry sail their Merry Mac with safety and aplomb in stiff winter trade winds at Guana Cay, I can testify to the boat’s ability to stand up to heavy air and choppy seas. Appropriately reefed for such conditions, the MerryMac can blast to windward in a blow without excessive pounding or a heavy weather helm. She digs in her leeward chine and screams on a reach. Off the wind before a following sea, she planes with ease when her crew shifts their weight aft. While the MerryMac can be a lively racer in a brisk breeze, in milder conditions it’s well suited to family outings. Until recently I was less certain of the MerryMac’s ability in light air so I was glad for breezes in the 2- to 7-knot range when I joined Nate Piper and McIntosh for a sail in Piper’s MerryMac on Great Bay. With so little wind at the launch ramp that I could see the mirror image of the boat reflected without a ripple on the water, the cat-rigged sharpie gained way as soon as we dropped the centerboard and hoisted the sail. While McIntosh spun stories about cruising the Caribbean in his Atkin cutter more than a half century ago, the MerryMac worked her way offshore steadily in air that seemed no more than a whisper. But when I put the helm down, she tacked in her own length. We found a stronger breeze in the middle of the bay so I tried some jibes. Once again the catboat responded with alacrity and grace, but no drama. Controlling the sheet and the boom during the jibes was as easy as I’ve ever experienced in decades of sailing small boats. When the wind finally died on us altogether, a few strokes from a paddle set us on course to ghost back to the launching ramp. It was during this ghosting that I noticed a wooden pad on the port side of the transom. “You can put an outboard on this?” I asked. “I have a little electric one on my boat and a battery I charge with a solar panel,” said McIntosh. He flashed me that twinkle in his eye again. It was the look of a man who had designed, built and outfitted his vessel for every possibility. Randy Peffer is a frequent contributor to WoodenBoat, the captain of the research schooner SARAH ABBOT and a relentless racer and gunkholer in all manner of small craft from canoes to catboats. 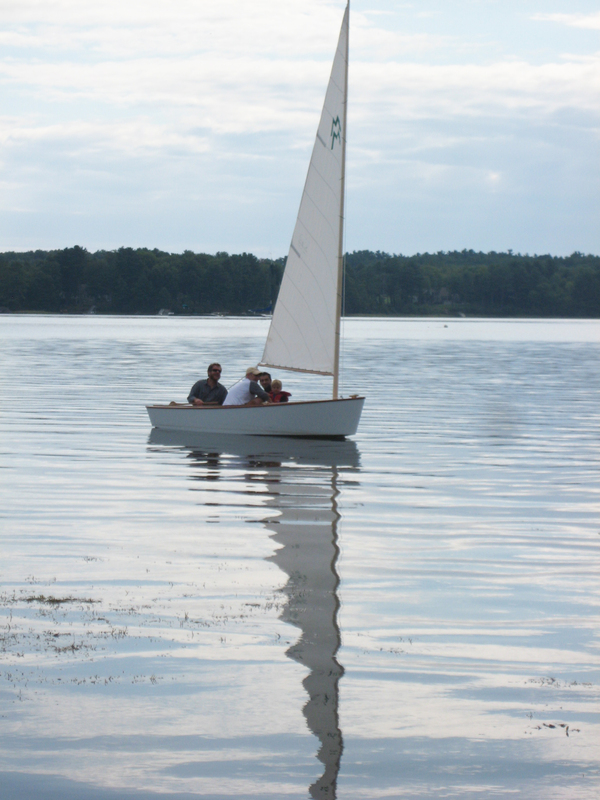 Piper Boatworks in coastal New Hampshire is the authorized builder in wood and fiberglass for MerryMacs. For a pricing and information contact Piper Boatworks, P.O. Box 879, Rye, NH 03870, 603-686-2232, nate@piperboat.com. Are the plans available for the “Merry Mac”? I live in The Yukon, Canada and would like to build one of these for my own use. Well, that’s disappointing… I had the same thought as Mr. Harder. I agree with the other two gentlemen, this would be a great boat for a DIYer to build! Mr. Piper, would you consider creating plans and selling them for single build licenses? I agree with the above gentlemen. It looks like a perfect DIY opportunity for amateur builders like myself. I’d purchase a set of plans readily and most likely build the boat. As I live in a remote town in the Pilbara region of Australia, freighting a boat from the States is not real practical. I do, however, have tools and access to quality materials. I’ll chime in too. I wish plans were available. I have always liked the looks of the Windmill, and I can easily see that MerryMac is a kissin’ cousin and seems to be better suited to recreational sailing with family. Me too!!!! Im in Australia! I also would purchase plans for a MeryMac to sail in Lake Ontario. We’ve let Nate Piper of Piper Boatworks know about the demand for plans for the MerryMac. He has been pleased by the response and reports that he has taken the suggestion under consideration. We’ll let readers know if and when plans become available. Stay tuned. Is this 98-year-old designer the one who created the Mac 10 dinghy? Mine is from the mid 60s, I think. It’s terrific. I posed the question to Nate Piper. He didn’t know of any connection to the Mac 10 dinghy. I live in Cabo San Lucas, Mexico and I would very much like to build on of these fine little catboats for my own use. Please advise if and when the plans become available. May I add my name to the list of people interested in plans? I also live in Australia! I had the good fortune to meet Ned while he was in Clearwater, Florida, visiting Clark Mills. It is interesting to see how similar Ned’s MerryMac and Clark’s Windmill are visually and in construction. Both boats were designed in 1953, just a few years after their time together in Panama. The Windmill was designed to meet a teenager’s need for speed, but the MerryMac would be a great and comfortable boat for every age and skill level. Looks like a great family project for kids to build and sail. It’s a definite step up from the Puddle Duck Racer. Put me down for plans too. I would buy the plans also. Looks like a great boat for me as well as my grand kids! One more for plans. This one in Quebec. I own a Windmill built in 1978; I bought it when I was a teenager. I too was immediately struck by the resemblances between the two boats, notably the hull shape and structure and the total lack of creature comforts. For comparison’s sake: LOA 15’6″, beam 4’8″, sail area 119 ft jib plus main. The Mill is fast and fun and a handful in a blow, demanding two agile sailors. Because my dinghy racing days are over and I still love the boat, I am considering how to make it more of a daysailer: convert dagger to centerboard (the dagger draws nearly 4′), add decks and flotation, add seating, some reef points and maybe some internal ballast. I vote for a plan set too. Love the simplicity. I’m land-bound in Los Angeles but I’ll buy a set when they become available. I have built several “Good Little Skiffs” from Pete Culler’s design, which is available in his book Skiffs and Schooners. It’s 14′ long, flat bottomed, and has a nice flare. It rows and sails very well, and I have visited a number of islands here in the Salish Sea in on of mine. I’ve built them in marine ply, despite Culler’s objections, at a cost of about 600 dollars in materials and they all performed flawlessly. I use the sprit rig shown in the book and it is indeed a very fine small-boat rig. 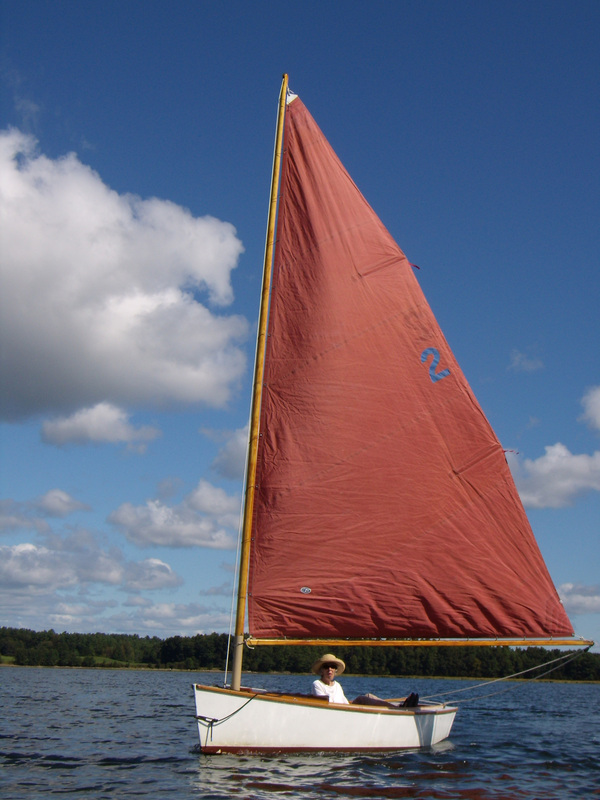 I now row and sail a 17′ faering with end compartments, a shallow keel with a steel shoe. It’s an excellent beach cruiser, but a bit heavy for hauling up a beach at low tide. The skiff was handier for that. I would buy plans also. I may be interested in plans but I would prefer to save time and suggest the builder consider producing kits.